Germs or bacteria are to be found in and on the body, and they can be transferred on to anything with which the body comes in contact. 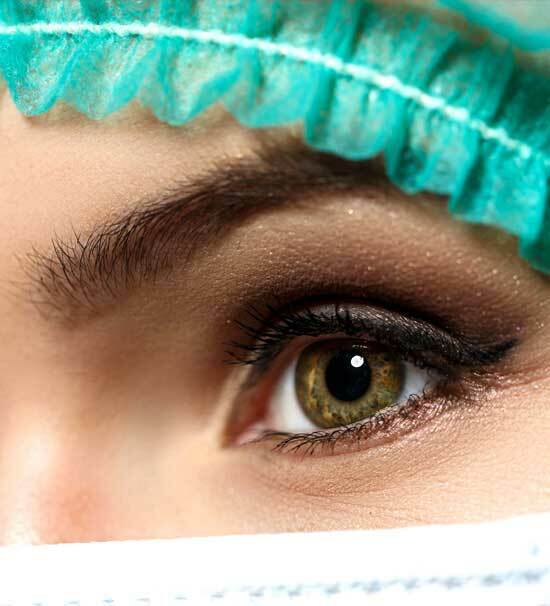 Personal hygiene in the food industry is essential to prevent germs from getting on to food. Self-respect is necessary for every food-handler because pride in one’s appearance promotes a high standard of cleanliness and physical fitness. Persons suffering from ill-health or who are not clean about themselves should not handle food. Always wash your hands in the particular wash-hand basins provided. Never in other sinks, I.e., in washing-up water or in sinks used to prepare food. Use hot water and disinfectant soap and lather hands, wrists and forearms. Use a clean nailbrush to clean under nails. Rub your hands together, then wash off under running water. Dry hands thoroughly, applying a clean towel or hot air dryer. Stop touching whatever will contaminate your hands before coming back to work (e.g., cleaning cloths, dirty dishes, cigarettes). Wash your hands regularly, to stop transferring bacteria from your hands to the workplace. Hands should always be cleaned. – Instantly after using the lavatory or toilet. – After sneezing or blowing your nose. – After handling dirty equipment. – After using cleaning materials. – Before coming on duty. – After handling raw food. How to Develop a Daily Personal Hygiene Policy at Work? Make a daily personal hygiene routine practices as an SOP for personal hygiene in the food industry. Keep clean fingernails and short. Stop using excessive volumes of nail polish, perfume or make-up. Inform your manager if you are suffering from a cold, painful throat, boils, skin rash, diarrhea, upset stomach or an infected cut. Your manager will decide whether you should be on duty or not. Chef hat: This is tall in shape and white in color. It can be made from disposable paper, starched linen or light reinforced materials. 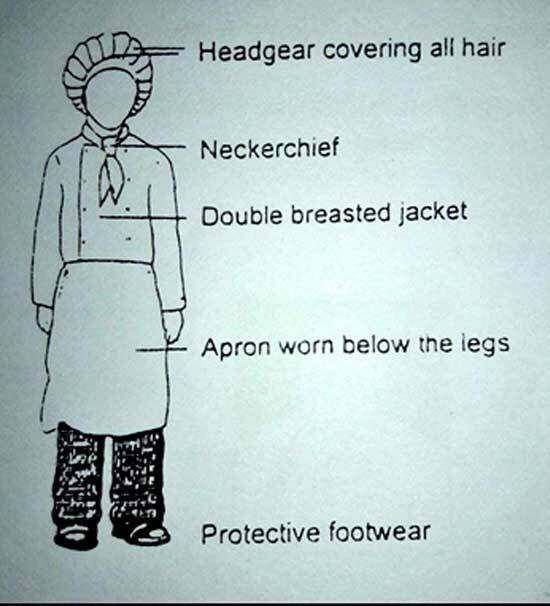 It is worn to prevent the hair from falling on to the food. Chef coat: This is usually white, double-breasted, and may have removable plastic buttons. Neckerchief: This is usually white, red or green and is worn around the neck to prevent sweating in the heat of the kitchen. Apron: This is thick white linen with removable tapes. It is worn to knee length to protect fire and oil coming in contact with the worker. Trousers: These are made of light cotton materials, in black and white checks. Shoes: Suitable footwear is as essential as any other parts of the uniforms. Safety shoes are recommended. Shoes are worn to prevent slipping and protect feet from stab wounds should knives be dropped. Don’t try to comb your hair or put on make-up in the food or public areas. Do not spit, cough or sneeze openly in food or open spaces, use a tissue wash your hands afterward. Stop picking your nose or teeth or scratch your head. Stop smoking in the work or public areas. Do not use your apron or part of your uniform to wipe your hands as this will contaminate your hands. Stop leaning or sitting on work surfaces. Do not leave clutter behind you clear up, wash and put away equipment and utensils. Do not leave rubbish and waste material lying around put into a covered refuse bin. Only hand-washing will keep your hands clean! 1. Always wash your hands before commencing work and still after using the toilet. 2. Tell your supervisor at once of any skin, nose, and throat or bowel trouble. 3. Cover cuts, sores with waterproof dressings. 4. Follow to the company dress code and always wear clean clothing and be clean. 5. Remember that smoking in public areas while on duty is forbidden and dangerous. 6. Keep your work area clean and tidy. Keep equipment and utensils clean. 7. Keep to a daily routine of personal cleanliness that means, a daily routine of personal hygiene in the food industry. 8. Never spit, cough or sneeze openly use a handkerchief. 9. Keep a spare, clean uniform available to change into at short notice. 10. Remember the law requires clean, fully equipped, well lit and air conditions for work areas.